How to Deliver Best Flower Arrangement for Mother's Day In Moreno Valley, Perris, Riverside and surrounding area. It’s the greatest time of the year again. Mother’s Day is here. This is the day we get to appreciate our mothers, the most strong, beautiful, and selfless human beings. They do so much for us and it’s time for us to show our appreciation for all that they do. Let’s show our mothers the love they deserve by gifting them an amazing bouquet of flowers. This year Mother’s day is on Sunday May 14th and Hispanic Mother’s Day is on the 10th of May. Flowers are the greatest gifts for our Mothers because flowers symbolize beauty and true love, which is what our mothers provide for us every day. Show mom, your mom, the mother of your children, your mother-in-law, and all mothers in your life that you care and love them and appreciate all that they do. All flowers are beautiful, and thank god, Mother’s Day is during spring. Spring, when all the flowers are in full bloom of all different colors. Roses are always a perfect because they come in so many different colors. A mixture of different colored roses in a bouquet will surely put a smile on your mom’s face. A customized flower basket with a mixture of assortments of flowers will make her jump in joy because now she can have the prettiest flowers of all varieties to herself that she can look at every day. Flowers that are the prettiest during spring are colorful lilies, different types of daisies, beautiful Iris, sunflowers, snapdragons, carnations, all colors of long stem Ecuadorian roses and so many more. Make sure you order your flowers through a local florist as soon as possible. Ordering through websites such as Teleflora, FTD or 1800 Flowers is not a great idea. The reason is, those are just call centers with really nice websites with photoshopped pictures. When you place an order with them, they send out the orders to a local florist and that local florist has to follow a recipe that comes with their order. Now making a photoshopped picture come to life is impossible for any florist. The florist may not have the flower of your choice at their shop and they will alternate with a different flower. Imagine how angry you will be if your mother's favorite flower never even reached her. All the thought that was put in the flowers wouldn’t even matter anymore. A local florist such as Garden Of Roses will take your order and make sure your mom receives the bouquet that you have so thoughtfully selected. They will ensure freshness and also make sure to give you a call in case something has to be changed. 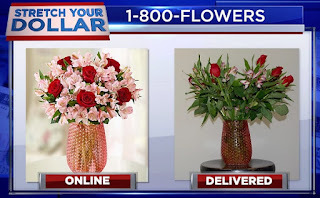 A Florist who receives an order from FTD, Teleflora or 1800 flowers, never gets to have the number of the customer so they are unable to make a call to let the sender know about any difficulties or alterations. Another reason to go through a local florist like Garden of Roses is a guaranteed delivery of your flowers just in case you cannot take them to you mom yourself. You want to ensure your flowers get delivered not only on time but also very fresh. Garden Of Roses ensures that your flowers get hand delivered to your mom and if there are any complications at all they will call you and let you know. Please do not disappoint yourself this Mother’s Day by going through an online website. Hurry and call your local Florist as soon as possible and let’s customize a perfect bouquet for the most perfect womans in your life. Let's put a smile on the Mother of Your Children, Your Mom and Every other Mom in the world. Let's celebrate Mother's Day with fresh Flowers! Valentines Day is only a month away and happens to be the busiest time of the year at any flower shop. So If you are considering sending flowers to your significant other on Valentine's Day (which you should) , The smartest thing to do is to order your flowers as soon as possible. Remember, the sooner you order, the florist will prioritize your order and guarantee the bouquet of flowers that you want. No matter what, you or anyone else in this world, don’t want to receive dead flowers or old flowers. You also don’t want to get alternative flowers because the florist ran out of the flowers that you did so much research to get for your loved ones. Keeping all this in mind, order your Valentine's Day flower bouquet ASAP. Another important fact to remember is , don’t order your flowers from a deceptive online website that is a wire service such as FTD, Teleflora , 1800 Flowers , Pro flowers, etc. You will be excited about their cheap prices and stunning photogenic flower bouquets but most likely you will not receive the flower arrangement that you saw on their website because all the pictures are professionally photographed & edited to feed your eyes. These online flower services are just a call center who sends out your orders to local florists in your area with only 70% of the money you spend on a bouquet, and I am telling you right now as a florist, those online flower services have no idea what flower inventory a local flower shop has for that day. So, when a local florist in your area gets your order and they don't have the exact flowers or colors, local florist have only one option! That is to substitute those flowers with something they have in stock for that day. So, with 30% less flower value and not have the exact flowers for that bouquet , We have no idea how to make something so natural like flowers look like a photoshop edited picture. So, unfortunately you will end up getting a 30% less valued flower bouquet consisting of the flowers that you didn't order ! And if your recipient is not lucky enough to get hand delivered, She will get Roses/Flowers in a BOX, shipped by fedex or ups. So, Spare yourself the nightmare of getting a bouquet you never wanted. Don't be fooled by those attractive pictures and unbelievable price point. Order your flowers from your local florist. A florist you can physically walk into to see their collection of flowers. Your local florist will provide you the best service, freshest flowers at a great deal. 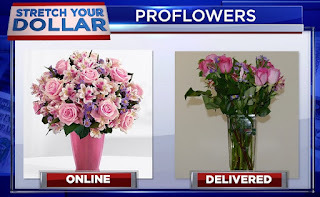 Now to find these local best florist in your city simply use search engine like Google, Yelp, Yahoo and type "Best local florist in Your city" . Simply Call them, visit their location, browse their websites . Ordering flowers from a local florist like Garden Of Roses ensures quality, beauty and your own satisfactory services. If you go onto Garden of Roses website because you can't come in physically, you will see pictures of arrangements that were made and taken in their own studio. No Photoshop here! Browse www.Gardenofroses.us or www.Gardenofroses.florist to get the perfect bouquet of fresh flowers that she deserves. You will have plenty of options to choose from. 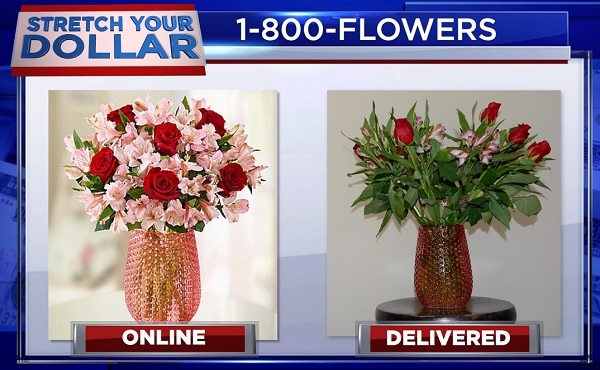 Also to ensure time and day of the delivery, since this year Valentine's Day falls on Tuesday, florist will be busy to delivering flowers in office hours. So Pre-order as soon as possible so she can receive her flowers and feel as beautiful as she is. Lets celebrate this beautiful day that stands for the greatest blessings and emotion of all. LOVE!!! So hurry and get your orders in for Valentine's day Flowers !! When it comes to sending flower bouquet to your loved ones, question is where to buy flowers, Which florist do same day delivery, are they Real local florist, Is the florist reliable and use fresh flowers in the bouquet! It would be best to check out the flower shops in Moreno Valley, CA. This guide would be able to help you get to know how much is a bouquet of flowers, how much are same day flower delivery, which flower shop to choose sending flower arrangement and more. It is time to turn that celebration into something even more special and memorable. What local florist should you choose to send flowers? When it comes to send flowers to Inland Empire California, City of Moreno Valley, City of Perris, City of Riverside, Garden of Roses is your best local flower shop. Garden of Roses deliver flowers to Moreno Valley, Perris, Riverside, March air Base and surrounding area! Garden of Roses rated Best local florist in Moreno Valley, Best flower shop in Perris, #1 flower delivery services in Riverside. Garden of Roses offer same day flower delivery to Moreno Valley, Perris, Riverside, Menifee, Beaumont and surrounding area. Why choose Garden of Roses for flower delivery? Garden of Roses achieved 5 Star Customer ratings on YELP, Google and Yahoo. They always use the fresh flowers for flower arrangement and bouquets. You have lots of choice of Flower Arrangement on their website. Birthday Flowers, Anniversary Flowers, Sympathy & Funeral flower arrangement, Get well flower bouquet. As a real local florist, Garden of Roses, offer hand delivered flower bouquet to the door step of your loved ones. We take one step further to provide excellent customer service by delivering the flowers ON time, on request garden of Roses deliver flowers on Holidays and Late night flower delivery available also. Another great reason to choose Garden of Roses as your favorite flower shop in Inland Empire is we send picture of the flower arrangement to our customer before delivery. So, customer could see what exactly they are sending to their loved ones. We communicate with our customer via text message thru out the whole process of the flower delivery. So, the Sender knows exactly when flowers has been delivered and how the recipient like the flowers! Garden of Roses has 2 website, where it’s very easy to order flowers online. Both online flower shop is easy to Navigate and 1-2-3 step to order flowers. If you are looking for a Florist in Perris CA, Flower Shop in Moreno Valley CA, Florist in Riverside CA, Flower Shop in Perris, Local Florist in Riverside, Garden of Roses is your best choice. Garden of Roses won the best flower shop award out of 30 local florist in Inland Empire. How much is a bouquet of flowers these days? Depending on the special occasion and flowers, Prices could vary from $20 ~ $200. Garden of Roses, uses the freshest flowers from around the world. Like long stem Ecuadorian Roses, Colombian Lilies, Dutch Tulips and California grown fresh seasonal flowers are always in stock. As a customer, you can choose your budget, colors and flowers, Designer team at Garden of Roses will make a stunning flower bouquet for you and will hand deliver to your special person. For Birthday Flowers average flower bouquet cost $59.99. Anniversary flowers average flower arrangement cost $79.99. For sympathy flowers average is $69.99. Flowers for funeral service cost bit more, for Standing Sprays, Casket Sprays price range is $120 ~ $250. You can always choose custom arrangement with custom budget for the appropriate occasions. All you have to do is Call Garden of Roses, the best local florist in Inland Empire. The design Team of Garden of Roses, will create a custom floral arrangement just for you. At Garden of Roses, you can not only buy and send flowers but also you can buy teddy bears, chocolate, balloons, greeting cards! Garden of Roses, offer free flower delivery to local area when you sign up on our website. Our normal local delivery fee is $10. Depending on the city in Inland Empire, flower delivery fee range from $10~$15. Shop online or Call today and Garden of Roses will take care of your floral needs. Find the Best Gifts and Flowers for Valentine's Day 2015 !!! Valentine's day is the day where love and romance is celebrated all around the world. Valentine's day is the one day where we all speak the language of love. Now, how do we express “ The Language of love ?” Well during the 18th century, lovers expressed their love for each other by presenting flowers and by sending greeting cards. The tradition continues onto the 21st century as lovers are brought together by the beauty and the “Silent Language” of beautiful flowers. Flowers are the perfect gift this valentines day or any day if you ask me. Below is a list of reasons why you cannot go wrong with flowers this Valentines Day. It will make “her” smile no matter what. Flowers can be delivered with chocolates and balloons. Ladies, surprise your Boy friend/Husband by delivering Flowers and chocolates to his work or his house. (Now how many times do you think he has received flowers ?!). So the question is, where can you find the best, freshest, flowers in town? Of course your first place to go is the local florist in your area such as Garden of Roses, will always carry the freshest flowers and have a wide variety of flowers for you to select from. A local florist will also have many different arrangements of flowers for you to choose from. If you need help finding the best local florist in your area, search on Google , Yahoo or Yelp. Read their reviews and look at their bouquet picture, I bet you will find the best flower shop in your area, Like Garden of Roses in Moreno Valley, CA the best local florist. - Every arrangement at your local flower shop is hand made by an expert florist. TIP : Never buy flowers from online shops such as FTD, Teleflora, or 1-800-Flowers. They all are just a website with lots of pretty looking flower picture and a huge call center !!! Usually what happens is that you will pick a beautiful flower arrangement for very attractive low price from their website, and when your loved ones receive the flowers , it will look nothing like what you selected. - The pictures are Photo-shopped so there is no way a florist is able to make the arrangement look like a photo shopped picture. If the flower that you choose is not available they will SUBSTITUTE for another flower even without your knowledge. And in many situation the flowers will never arrive. So why go through the trouble of picking a beautiful arrangement and then not getting the flowers, what you paid for?? You choose a local florist and call them directly to avoid the problems listed above. When should you order your flowers for Valentines day? Well Valentines Day is the busiest day at a flower shop so do not wait till the last minute. If you want your flowers delivered than you definitely need to call a week or two in advance so your flowers are delivered on time and there is no rush in delivering your flowers. If you are a procrastinator, and last minute is your only option, than feel free to come into a local flower shop like Garden of Roses and pick a bouquet of your choice from many selections. Today's Brides, Event planners, Business Owners, Restaurant owners and rest of us like DIY projects. When it comes to flowers, we are more excited ! With Few basic steps you can make your Restaurant, Your Party, Your Corporate Meetings, Your Offices looks way gorgeous and attractive to your guest. 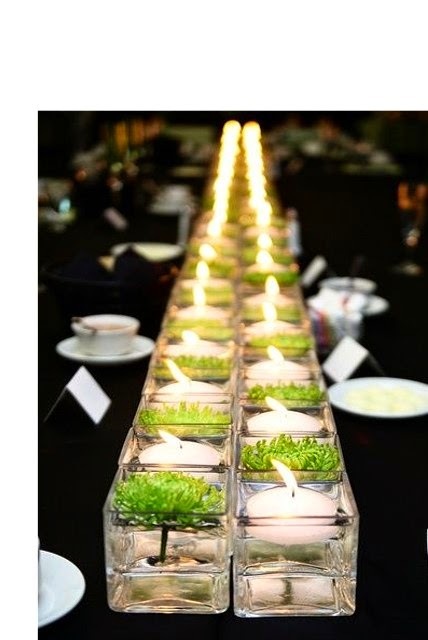 So, we picked few examples of centerpiece designs that anyone can do easily. You could create centerpieces like these designs for Restaurants, Family Gathering, Friends Birthday Party, Weddings , Office events, etc. We will cover few important steps that would make your project much easier and your guest will be definitely amazed by your table centerpieces ! Step 1: For Selecting Designs, You could use Google Image Search or you can easily Create a free account and Browse designs at Pinterest , Instagram Search for few designs that you like. These are only example, don’t feel shy to try new key words. Once you select the designs you like, you are ready to Shop for vases and fresh flowers. Step 2: From the design Now you know what style vases you need. You can buy Vases from few different places. These are online or local places where you can buy Vases at a great deals Michaels, Amazon, ebay. You should buy vases 10pc~12pc/set . 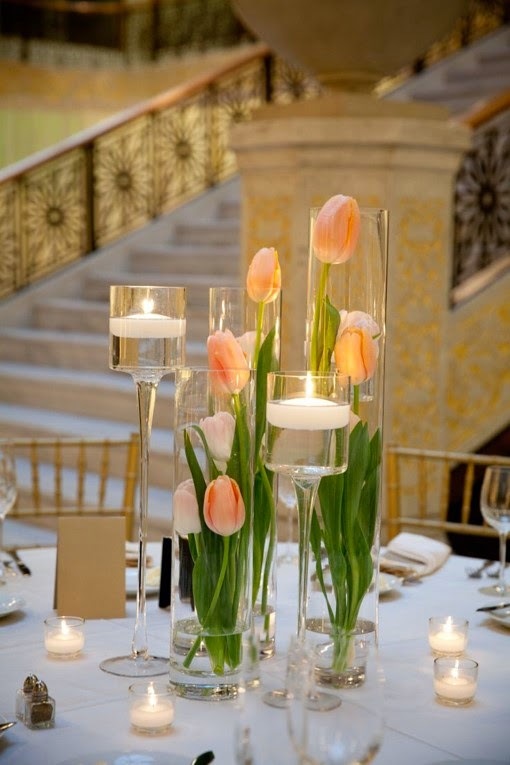 These vases you can use for many different events like weddings, parties. 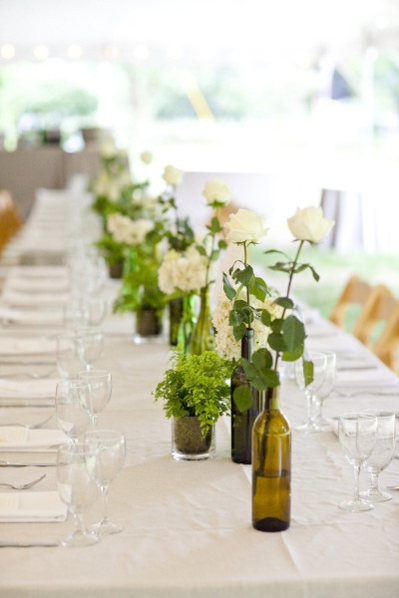 If you are doing big event for 50~70 tables, you could buy 6/7 different sets of vases. Step 3: After selecting centerpiece designs, You know what flowers to get. If you are not sure about the name of the Flowers, You could just ask you flower supplier, They should be able to tell you the name and availability of the flowers. Make sure, you Get the freshest flowers from your Best Local Florist Like Garden of Roses. You should always give a week notice to your florist, so you can get exactly the flowers you want. You can easily search on Google, YELP or Yahoo to find the Best Local Florist in your area. 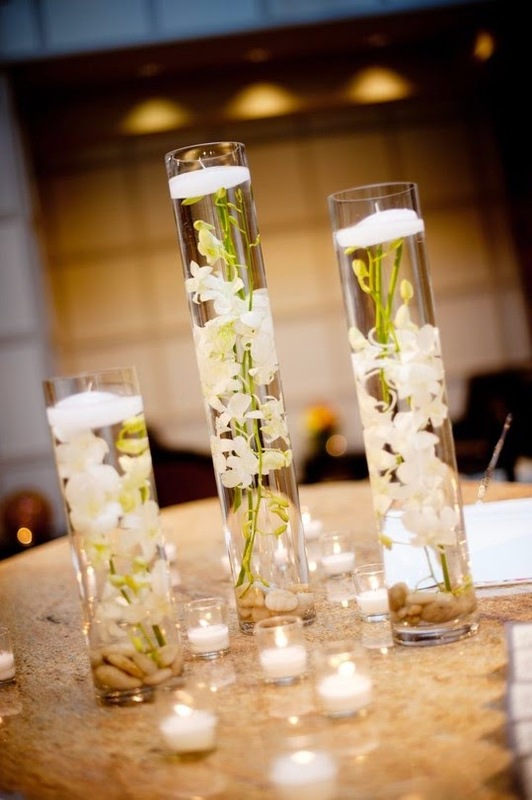 Step 4: Day of the Event you should have Designs, Clean Vases, Fresh Flowers. Now Get some Clippers, Scissors, Clear tape, Flower Food and few helping hands, You are ready make your party POP ! Don't forget to turn ON the Music ! Now You will learn how to create 5 different centerpiece designs and by practicing these basic designs, you can bring lot more on the table. 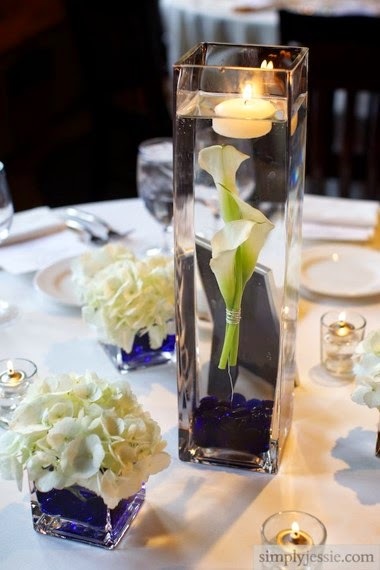 Cylinder Vase under water floral design is a very simple elegant design..
 We will use 10 Cylinder vases to create designs with Submerged/Under water Single Stem Flowers like this. You can use many other flowers of your choice. 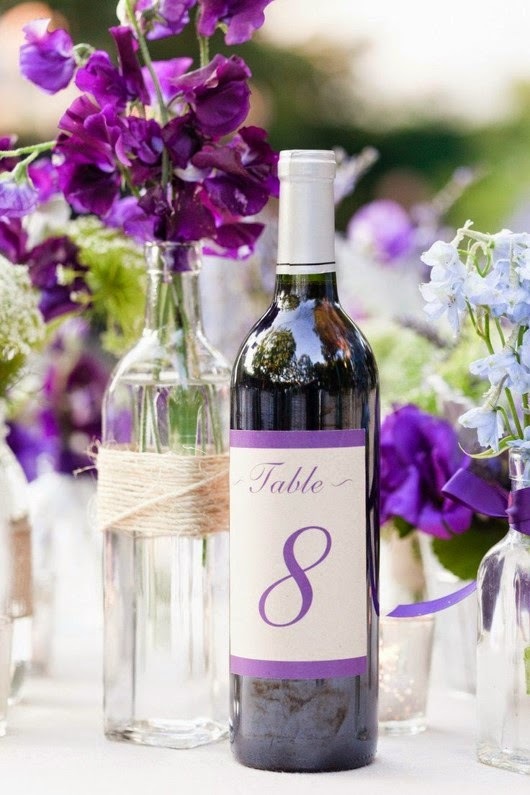 Wine Bottle floral designs are very cost effective simple elegant design. 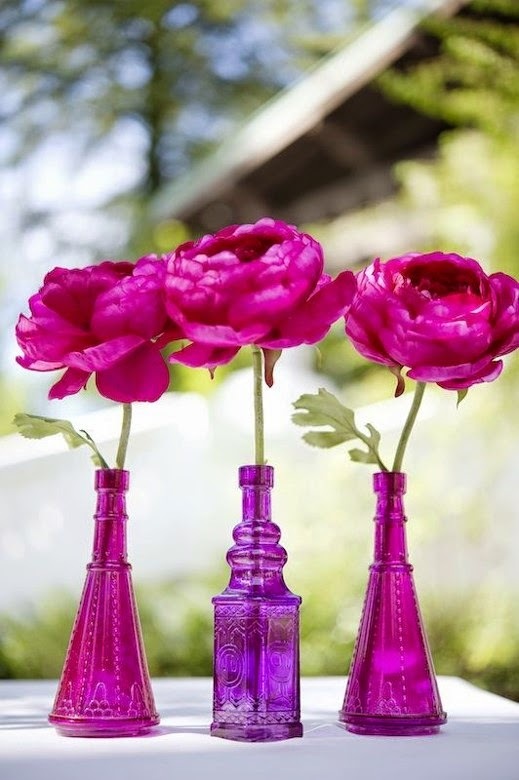  We will use 10 wine bottles to create designs with Single Stem Flowers like this.  We can wrap some burlap or Raffia around the bottles for extra texture. 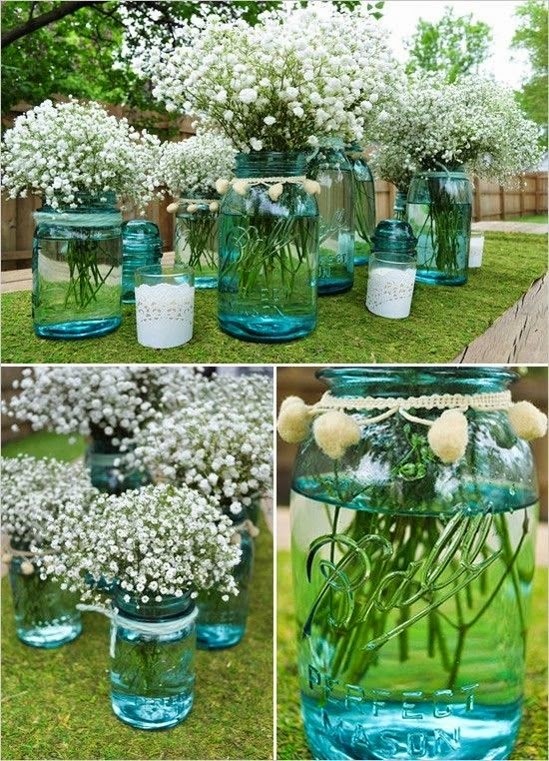 Floral designs with Mason Jars are very popular and cost effective simple elegant design. 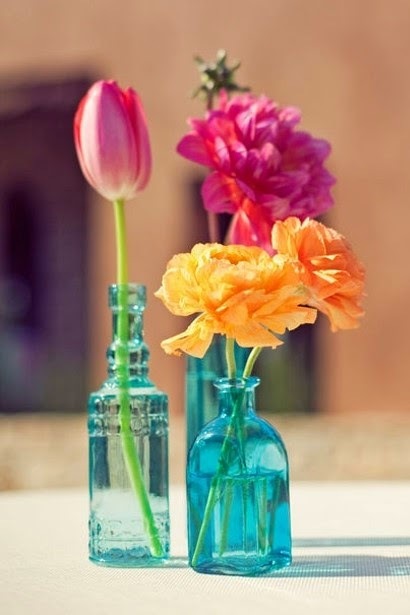  We will use 10 Mason Jars to create designs with Multi-stem or Single Stem Flowers like this. Most likely you will use more than 3-4 stems since Mason Jars has big opening. Floral design with Small vases of Different Colors, Different Shapes and Sizes are very modern and cost effective simple elegant design . 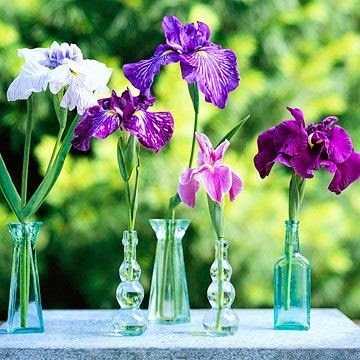 Floral design with square vases of Different Sizes is contemporary yet simple elegant design . 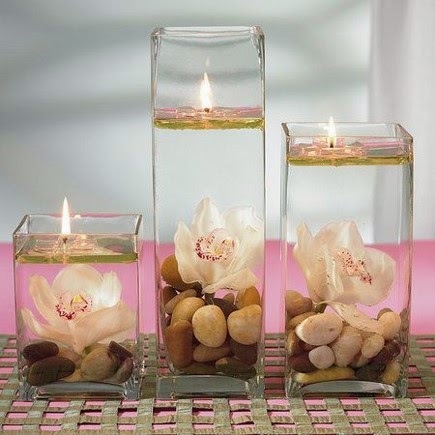  Using floating candles is very good idea. Tips : Some times some things are better done by experts ! Find the best local floral designer from real local florist like Garden of Roses in Inland Empire and You will save tons of time, headache and your event will be spectacular. 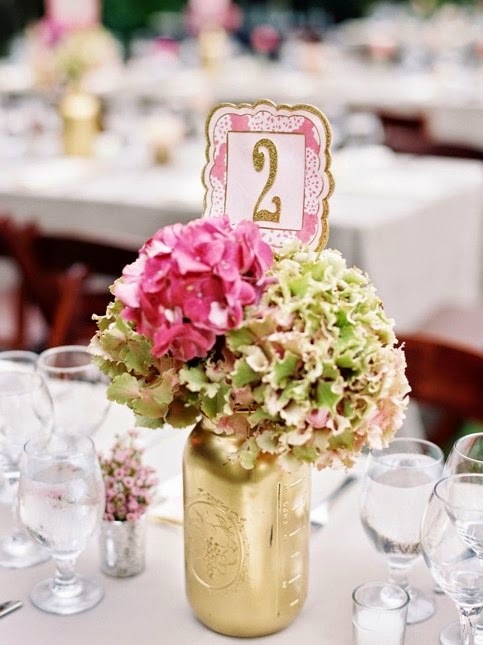 So, if you have a flower budget for big events do it from an floral expert, or use this article to create simple elegant yet budget oriented table centerpieces.